It is officially the 1st of December which means Christmas is well and truly on its way! Today I am bringing you a little DIY post to help you make some new decorations for your tree, or if like me you are putting your first tree up this year this is a cheap and easy way to start off your collection. 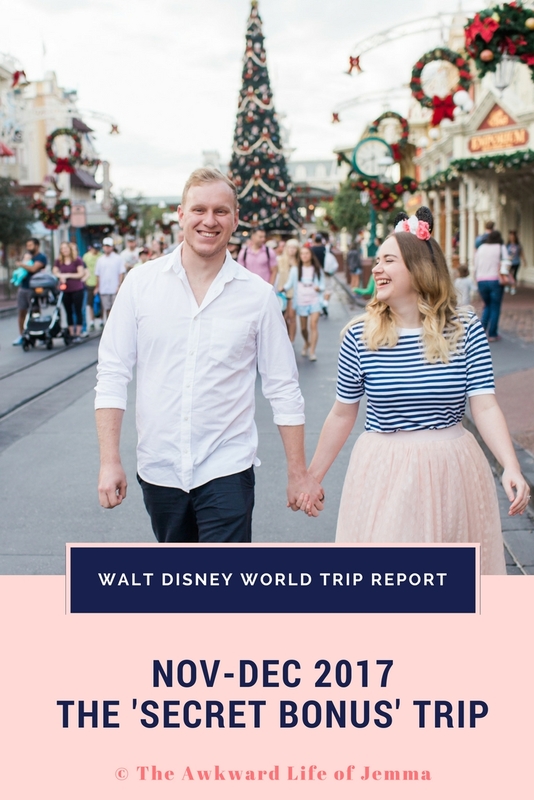 I've been browsing the Christmas tag on Pinterest for ages now and have been inspired to try lots of new things for our first Christmas since moving into our flat. Decorations are top of my list as we will be putting up our tree this weekend! 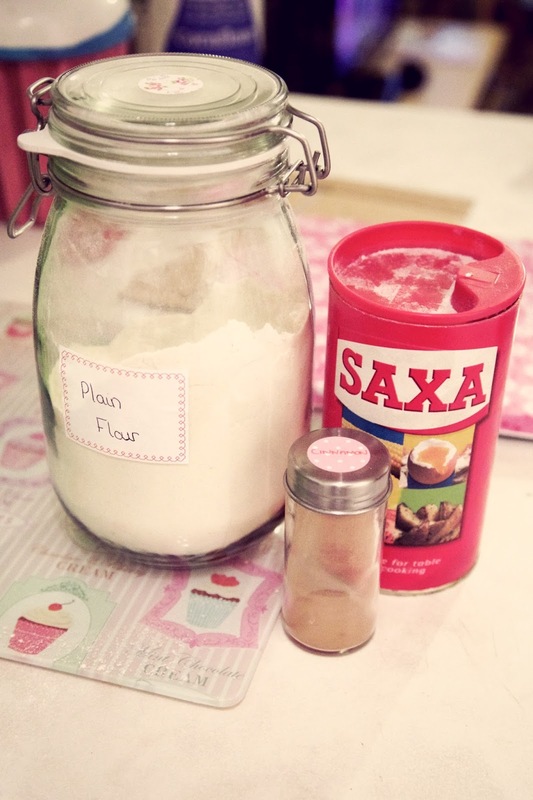 You might remember making decorations from salt dough back when you were small, and this is a simple twist on that idea. 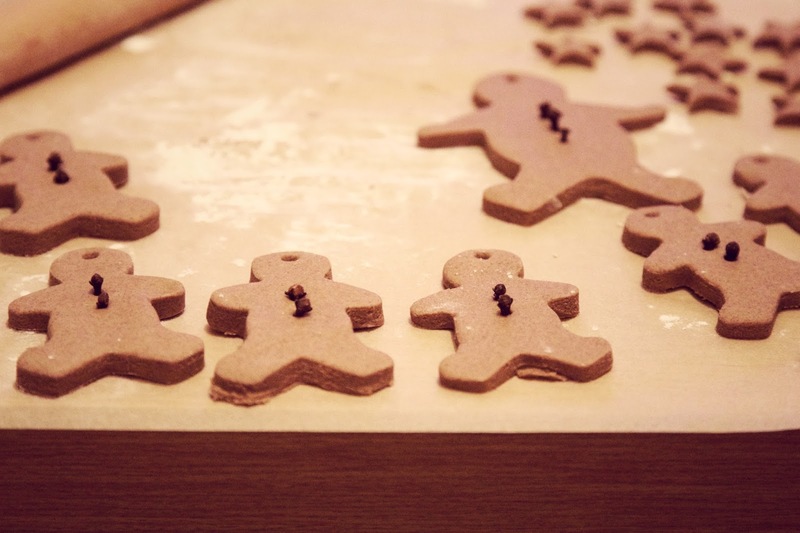 Cinnamon salt dough is great for creating faux gingerbread decorations because it has a similar look and smell to gingerbread but it won't go off. I used this recipe from Growing a Jewelled Rose which I found on - you guessed it - Pinterest. You will need: 1 cup of Plain Flour, 1/2 cup of Table Salt, 1/2 cup of Cinnamon and 3/4 cup of warm water, that's it! 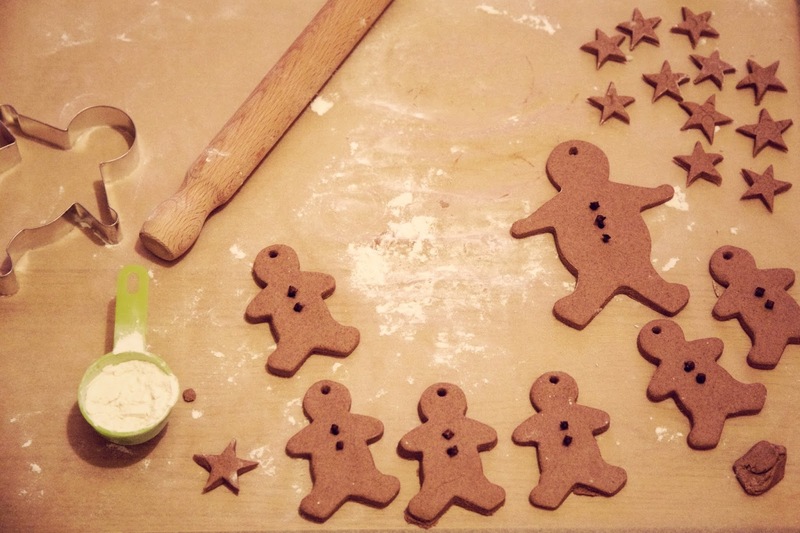 (To give your gingerbread men buttons you will also need cloves). Mix up the ingredients in a bowl and then knead with your hands to form a dough. Sprinkle a hard surface with flour to stop it from sticking and then roll out your dough. 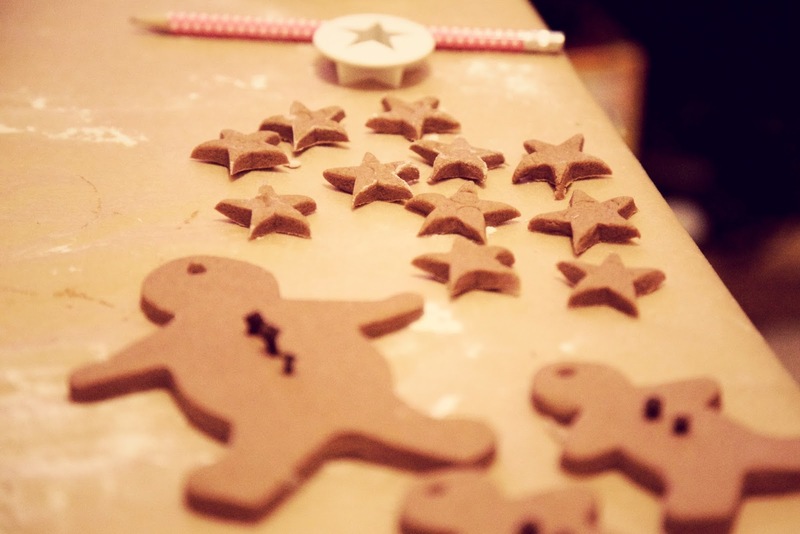 Use gingerbread man/woman/child cutters to cut out the shapes, and using a straw or pencil make a small hole in the top for your twine or ribbon. If using, add 2-3 cloves to form buttons. I also used a star shaped plunger to cut out some star shapes which I plan to use to make a garland. Leave to air dry for several days (the original recipe called for 24 hours, but mine took much longer) or speed up the process by placing in the oven at 100ºC for an hour or so (keep checking them). Once the ornaments are dry I plan to glaze them with mod-podge mixed with a bit of gold glitter to give them a Christmas sparkle and add a piece of green, white and red candy cane striped ribbon to form a scarf. I must also add that this dough smells amazing because of the cinnamon and cloves which helps to give them an extra christmassy feel. Yours should smell even better, and be slightly darker in colour, because I only had half the amount of cinnamon required - whoops! And there you have it, easy and cheap homemade decorations for your tree, let me know if you decide to have a go at making your own! Also check back on Friday when I will be posting photos of our finished decorations (we're also making our own white clay personalised hanging stars) and our beautiful tree.